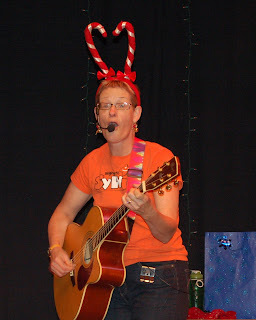 S.C. is coming to town! No, not Santa Claus. 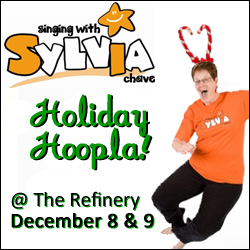 It's Sylvia Chave and her Holiday Hoopla. ~ Thursday, December 8, 10:30 a.m.
~ Thursday, December 8, 1 p.m.
~ Friday, December 9, 10:30 a.m.
~ Friday, December 9, 1 p.m.
Order tickets online at ontheboards.ca or by calling The Refinery Box Office, 653-5191. Tickets are $5 in advance or $7 at the door. Children under two are free. Group rates are available for schools, preschools and daycares.